Porch Swing Creations: I Have My Eyes on You! Luckily I haven't shared this card with you all yet so we won't end the week empty handed! This card is totally ridiculous, goofy, and crazy - exactly like the person I made it for LOL! A close friend celebrated a milestone birthday last week and we attended a surprise birthday party in her honor over the weekend. She owns two adorable Chihuahua's so it was an obvious choice to include them into my card. I searched online for a little inspiration and decided to go over the top - did I succeed?? The camera didn't pick it up unfortunately, but I did cover his eyes and the frosting of the cupcake in Crystal Effects so that they would shine when the light hit them. Before the Crystal Effects on the Cupcake was dry I sprinkled a little Dazzling Diamonds on top. This is a great technique to use because the glitter will never rub off! Hope this card added a smile to your start of the weekend! I'll see you all back here next week! Melissa, this card is HILARIOUS! It made me laugh out loud...I luv it....thanks for sharing. Oh my gosh, this is so adorable. I'll bet you're girlfriend laughed at the cuteness. 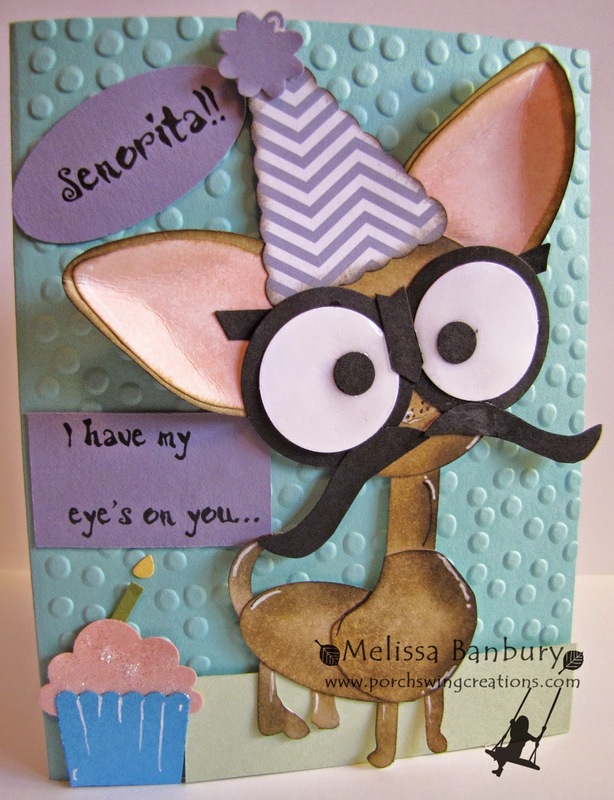 You are so thoughtful creating a chihuhua card. I once had two myself. Both 3 lbs and pure white. Made me laugh. The ears are the best. TFS! How cute is he!!! Love the ears.